Builder Blinds of NW Florida is proud to be able to offer this service knowing that few companies do. Let’s be honest about it, life happens and sometimes that results in your need for window covering repairs in Pensacola and nearby. Even the most durable window treatments could possible end up needing repair work done. The good news is that this is possible and can save you a bundle from having to possibly replace your window coverings all together. We work with both residential and commercial clients for all of their window covering needs, including repairs. We take this line of work seriously and it shows with the customer feedback and high customer satisfaction rating we have. Originally started in 1999 on the other side of the country, we were fortunate enough to relocate to the Gulf Coast in 2011. Naturally, we had the bring the business with us that we already knew and loved. So we are honored to now be able to serve clients here in the Pensacola area. As a Veteran owned business, we certainly appreciate being a part of the community here in Blue Angel country. Now, we look forward to working with you and taking care of your service needs, including repairing blinds, shutters and shades. Don’t throw in the towel when it comes to your blinds, shutters or shades; let us fix them up for you instead. Call us at 850.203.1882 for all you window covering repair needs. The type of window coverings that you have will dictate how many little parts there are and what can go wrong. The length of time that you have had your window treatments will also determine what can go wrong. What is important is knowing who to call on when you find yourself in need of this type or repair service work. From shutter repairs to broken blinds, we can take care of all your window treatments. Our job is to make sure that you are able to get your blinds, shades or shutters back to good as new condition, if not better. If for some reason your window coverings are beyond repair we can then discuss with you the options that you have. Or, if the cost of repair would be more than your window treatments may be worth now, we can review the idea of moving forward with updating and upgrading. The bottom line is that we are just here to help. So we want to be able to offer you solutions that make sense. We want to be able to work with you to try to salvage your existing window treatments and restore them back to the original state. When it comes to window coverings in Pensacola, you can rest assured we are the experts. The only name that you need to know when it comes to window covering repairs is Builders Blinds of NW Florida. It doesn’t matter how your window coverings got in a state of disrepair, acting quickly to fix them is what counts. Don’t keep putting off your repair needs because it will only make things worse. We have the training, skills, experience and equipment needed to execute this job with meticulous skill and precision. 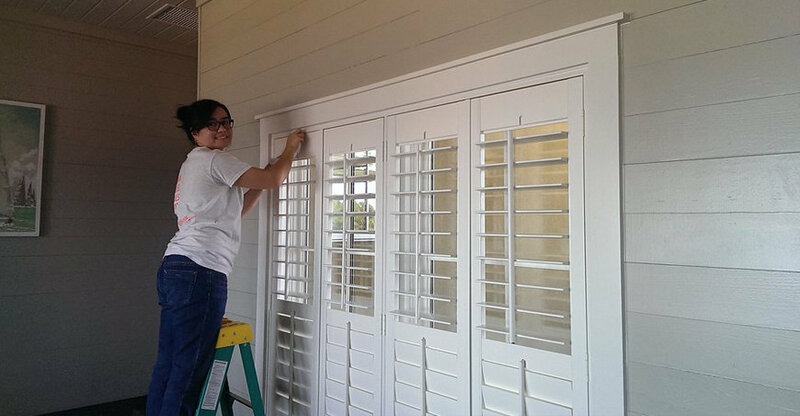 Call on our Pensacola shutter company today and let’s get started taking care of your service and repair needs. We look forward to working with you. Schedule your Free Consultation today by giving us a call at 850.857.9467 or you can use the form to send us your contact info. Copyright © 2019, Builder Blinds of NW Florida. All rights reserved.